Brought to us by the owners of Vini and Berta, Ester opened its doors a couple of years ago in an unassuming location in Chippendale. Since that opening, it has received numerous accolades, including winning the Best New Restaurant of the Year in 2014. As a result, it has been on my ‘to try’ list for a while – regrettably, it’s taken me almost two years to get my act together and make a booking. Getting a reservation at Ester is not an easy feat, particularly on a weekend night, so I was elated to have secured a table at 9pm on a Wednesday night. And yes, it was a full house even at that time. The space itself is understated yet remarkably elegant, with the wood fired oven, stone washed arches and hanging lights setting the scene for a delightful experience. Chicken / garlic bread sauce ($36): while the chicken is cooked to perfection, the real star of this dish is that divine garlic bread sauce – it literally tastes like garlic bread! Three milks ($15): to be honest, I wasn’t expecting the dessert to even come close to the quality of the mains, but Ester did not disappoint. Pictured above, the ‘three milks’ is a combination of ricotta pana cotta, sheep’s milk yoghurt and dulce de leche hidden under the the other two milks. 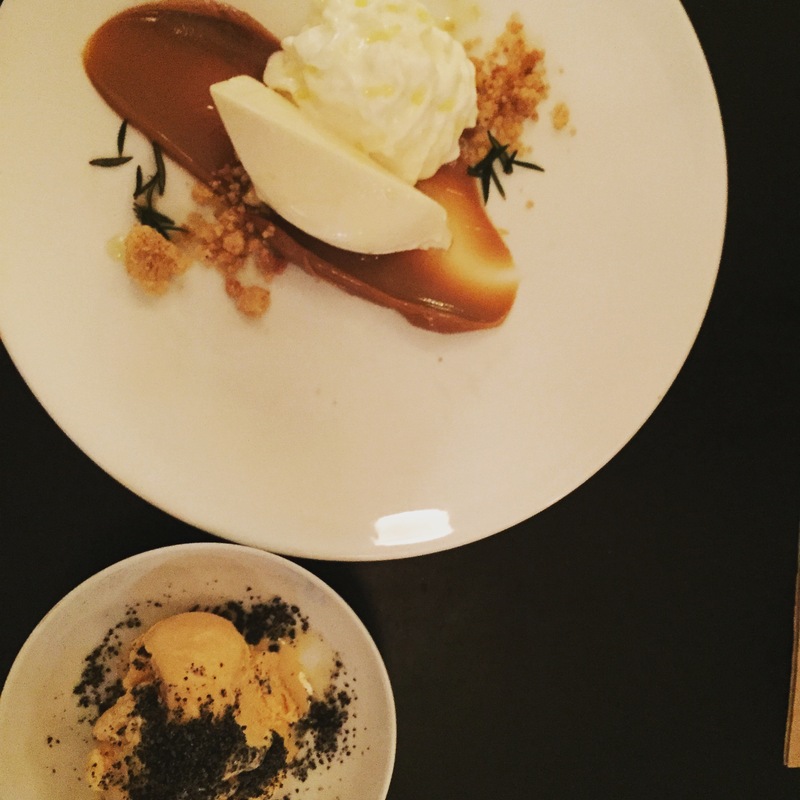 Add to this the texture of biscuit crumble and rosemary, this dish will leave you wanting more. Salted caramel semi-freddo ($4): pictured above, what makes this dish is the texture of the black sesame sugar. The recipe is here if you’d like to try it for yourself! It’s rare that you go to a restaurant and fall in love with every single dish. I can happily say that Ester is one of those rare places – the food is simple yet stunningly delicious, clearly inspired by the wood fired oven. The space is unassuming yet impressive, giving you the perfect dining experience of fabulous food coupled with a casual atmosphere. The only thing you could fault Ester on is the difficulty in getting a reservation. This entry was posted in Uncategorized and tagged Chippendale, food, Wood-fired. Bookmark the permalink. This all looks elegant and so tasty. Would love to try it one day. ooh it’s been a while since my last visit to ester, will definitely have to try the beef tartare!